In 1609, during Time of Troubles, Tsar of Russia Vasily IV Shuisky in the Treaty of Wiborg promised to cede the Korela (Kexholm) Fortress and County to Sweden in recompense for military support. When in 1610, Tsar Vasily was deposed, Russia refused to cede the Korela County. Sweden began military operations against Russia. The Swedes conquered the Korela Fortress in March 1611. The southern part of Korela County was in their hands and Swedes sought to extend their power to north. Karelian and Russian partisan formations opposed them. For example, they had a small fortification in Ännikänniemi Cape near Uukuniemi Village. In July 1614, Swedish troops under the command of Hans Munck left the Kexholm to attack the Olonets. On July 27, when Munck was in Kurkijoki, he received the message about the approach of the Russian troops, which, for their part, attack Kexholm County. A battle took place on the shore of the Ristlahti Bay. On the Russian side were 400 streltsys (shooters) and 200 cossacks, which arriving to Pyhäjärvi Lake by longships, and 100 local Karelian partisans. When Munck beat the Russians on the beach, they retreated to their longships. Three longships sank from overload. Two flags were captured. Swedes followed the enemy along the coast and stumbled upon the fortification of Ännikänniemi Cape. The streltsys fired back successfully and Munch was seriously injured, but finally the Russian troops suffered a defeat and retreated to Olonets. The question of belonging of the Kexholm County to Sweden solved during the Battle of Ristlahti. The Russo-Swedish war finished at March 9, 1617 when the Stolbovo Peace Treaty was signed. Memorial to the Battle of Ristlahti was unveiled in the battlefield on August 22, 1937. It was designed by architect Elsi Borg, and the reliefs were made by sculptor Lauri Leppänen. The original memorial was left to the USSR after the Winter War. The bronze reliefs was removed from the memorial during the evacuation and installed later to the new monument. The new memorial to the Battle of Ristlahti was unveiled on June 5, 1982 in a few kilometers from the old one, in Finland. 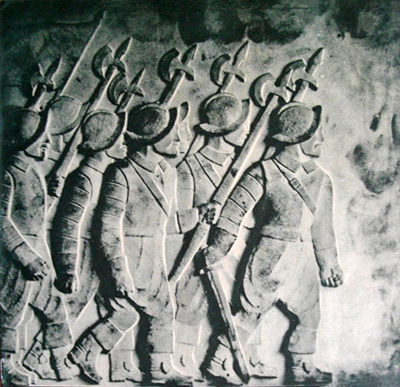 In 2014 in Russia was unveiled the memorial plaque to the Battle of Ristlahti, which contain the images of reliefs from the memorial.